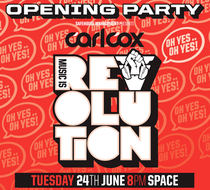 Tonight, Carl Cox and Safehouse Management finally kick off Music Is Revolution, their 13th consecutive season at Space, Ibiza, for a 14-week extended run. The opening party is always a highlight in Carl’s season and tonight should go off with a bang with Carl playing a mammoth 10-hour set to celebrate. There’ll also be sets from the likes of Danny Tenaglia and Uner, alongside Igor Marijuan, DJ Callum, Hofer66, David Moreno, Nick Halkes, Crissy Kybosh and Andy Bailey. Check the new video below.